From restaurants and shopping malls to office buildings and warehouses, the vast majority of places in the U.S. ban or limit indoor smoking. No smoking signage, which includes the image of a lit cigarette with a slash through it, commonly appears in indoor public places. Most people have become accustomed to not being permitted to smoke indoors. 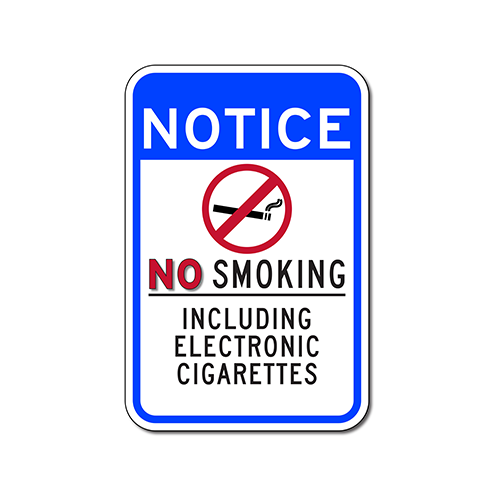 In recent years outdoor no smoking signs have also become more popular as smoking bans in public parks, beaches and other recreational areas have become the norm. Many businesses and restaurants also post no smoking signs adding “within 25 feet of entrance and exits and operable windows” or post a sign for designated smoking area with ashtray where people can smoke. Now with the new trend of smoking electronic cigarettes or “vaping” as it is sometimes called, businesses and governments are struggling to cope with banning or prohibiting it. Because e-cigarettes are so new, the FDA does not yet regulate them so there’s no official government force outlawing their use as there are with cigarette smoking. With no clear set of rules or regulations guiding their use, clashes are taking place between those who vape and those who run and manage businesses. E-cigarettes emit a vapor instead of ash and smoke and thus their manufacturers claim they are safe. Yet they do use the drug nicotine in a liquid form and no one is quite sure whether they are harmless or not. e-cigs can be smoked more discretely and do not produce the same odor as cigarette smoking. While the FDA and other government agencies are trying to figure out what to do with regard to formally banning or regulating the devices, businesses and local governments are largely on their own regarding how they handle the issue. Some beaches in Southern California have banned e-cigarette usage same as tobacco cigarette use and post specific no smoking signs saying so. 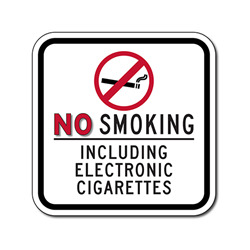 Since the law is unclear, businesses and property managers can minimize disputes with patrons by posting no smoking signage, including e-cigarettes in the same way they post the standard no smoking signs.